Connected root systems reduced the negative impact of August temperatures and insect outbreak on growth. Root connections between trees can be an ecological advantage of clonal plant species in environments with unevenly distributed resources. We investigated the effects of root connectivity in stands of balsam poplar in Quebec (Canada). We evaluated differences in growth response between groups of trees with and without root connections through climate-growth analyses, comparison of the growth dynamics, and analysis of growth response to a severe forest tent caterpillar (FTC) outbreak. Current May temperature had a positive influence on radial growth of both connected and non-connected trees. Growth of non-connected trees was negatively affected by August temperatures (r = −0.3) while connected trees did not reveal a significant relationship for that month. A mixed effect ANOVA showed a significant difference (F 1, 25 = 5.59, p = 0.02) in growth responses to FTC outbreak between connected and non-connected trees. Connected trees grew on average 16 % better than unconnected trees during the outbreak, with bootstrapped 95 % confidence range from 2.28 to 31.36 %. 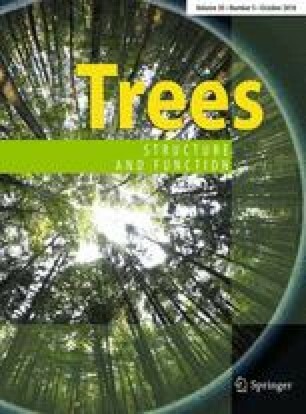 The study suggests a sharing of resources through root connections, affecting radial growth of connected balsam poplar trees under both average and extreme environmental conditions. This study was funded by a doctoral scholarship Bourse en Milieu Pratique Innovation to K.E. Adonsou provided by Fonds de Recherche Nature et Technologie du Québec, Natural Sciences and Engineering Research Council of Canada (NSERC) and Norbord Industries Inc. Additional financial support was provided through a Discovery grant to A. DesRochers from Natural Sciences and Engineering Research Council of Canada. We thank the Rivest family, the landowner who generously accepted to sample in site 3. We also thank Melanie Desrochers for help with the for sampling sites location figure, and many students and technicians for their help in the field. The study was done within the framework of NordicDendro, a Nordic-Canadian network on forest growth research, supported by the Nordic Council of Ministers (Grant No. 12262 to ID).